artist's work. Thom's portrait work was very limited and confined mainly to his early years as an artist and a student at UC Berkeley, where he painted portraits of his friends. Other than "Prince of Peace" this is the only portrait published by the artist and perhaps is an essential painting for any Thomas Kinkade collection. In the "Old Watchmaker", Kinkade captures the master craftsman. The Watchmaker in his twilight years, seems to b viewing the newly completed timepiece and reflecting on the learned skill that perhaps became extinct with his generation. In The Gallery this Week! Thom painted Old Watchmaker in his early twenties. 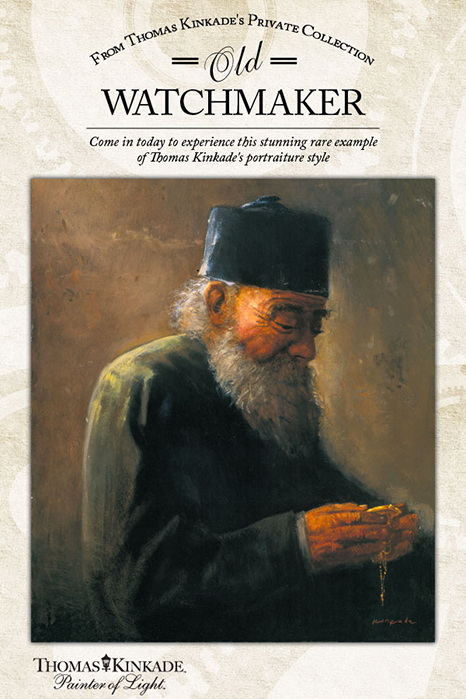 Old Watchmaker is a rare example of Thom's portraiture style. Old Watchmaker was painted in oils. Even in this portrait painting, Thom infuses an overhead source of light for the Old Watchmaker. The richness of textures from the fabrics, to the hands, and beard draw the observer in for a deeper view. "As a mature artist, I seldom paint portraits, preferring to consider human personality through its cultural expressions - home, family, village scenes, and cityscapes. But character studies like Old Watchmaker confirm that this was not always the case. Early in my career, I was fascinated by intimate descriptions of the human spirit - much in the manner of my artistic heros Titian and Rembrandt. My Old Watchmaker painted in oil when I was in my early twenties and just learning my craft, is a warm portrayal of a human type that was dear to my painter's heart, but remote from my world - the master European craftsman. The watchmaker's patient skill is inscribed in his careworn, wrinkled face, in the intense concentration of his gaze, in his wonderful, supple-strong hands. This is a man whose diligence and steadfast character has allowed him to endure the many obstacles he has faced in life. In this tribute to the watchmaker, I think that I anticipate the depth of my developing commitment to my own craft. Like the Old Watchmaker I somehow knew that God lives in the details, and that as scripture affirms, it is good to work well with one's hands." Come by the gallery today to get a glimpse of this true gem. You will be amazed at how it draws you in and captures your attention right away. We are only beginning to understand what a true master Thomas Kinkade was. See you soon!